- Bound Stems with Serengeti at Beat Kitchen - Bound Stems are high on the list of Chicago's most notable current bands. They released their second LP, "The Family Afloat," last September on Flameshovel Records. Doors 8 p.m., show 8:30 p.m., $8, 21 and over. More info and tickets. - Coupleskate with Euphone and Reds & Blue at Empty Bottle - "Local indie rock sweethearts" Coupleskate will celebrate the release of their debut LP, "Don't Scare the Horses." The band will play the record from start to finish. 10 p.m., $8, 21 and over. More info and tickets. - Jeff Tweedy at The Vic - The Wilco front man is set to play two solo shows at the Vic this weekend as the band gears up for new DVD and album releases as well as touring later this year. Doors 7 p.m., show 8 p.m., $100. Also on Friday. More info and tickets. - Delta Spirit with Other Lives at Dawes at Double Door - Delta Spirit hail from California and play a mix of indie rock and soul. Doors 8 p.m./show 9 p.m., $8 advance/$10 at door, 21 and over. More info and tickets. 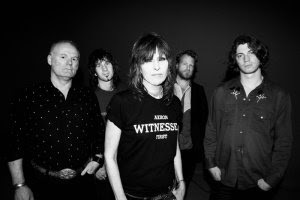 - The Pretenders at The Riviera - Chrissie Hynde and company are touring to support their first new record, "Break Up the Concrete," since 2002's "Loose Screw." They will hit Chicago Sunday with the new, rockabilly inspired songs as well as the classics. American Bang will open. Doors 6 p.m., show 7:30 p.m., $42. More info and tickets.